I am home again from the Massachusetts "Seasons of Witchery" tour and it went great! My husband Ken, and I took the last day and played tourist and visited Gloucester and Rockport Massachusetts. Yes indeed we had lob-stah rolls for lunch! In a fun restaurant on the water- where we watched the lobster boats coming in with their catch. Here is a picture of us at the beach in Rockport. I have spent the past few days catching back up on correspondence and paperwork, and things are starting to settle down. I have new orders for Garden Witch Pentacles to fill, and some 2014 Llewellyn annual articles to write. (It keeps me busy while I wait to hear about my latest book proposal to Llewellyn.) Fingers crossed. Today I posted a snapshot of the Witches Tarot book, the card back and a sampling of the cards on Facebook. here is the picture.The boxed sets just hit the Llewellyn warehouse last week. So they will be all ready to go on September 8th on the official release day! Recently I saw a post on the Llewellyn blog, from a person complaining that the Witches Tarot deck lacked "diversity" and was nothing but "white people". This yanked my chain for a couple of reasons. First and foremost because it is simply not the case. So, I took a deep breath and politely responded, informing the post-ee that they were incorrect. The angel in the Lovers card is in fact- Asian. 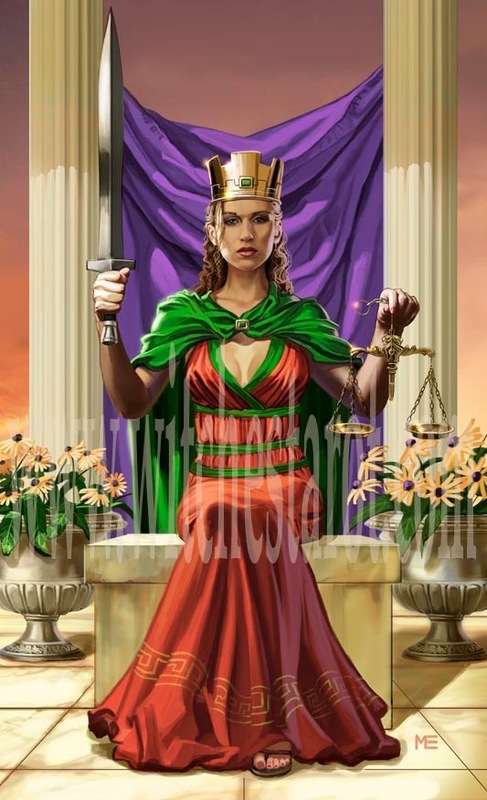 Furthermore, Themis who is portrayed in the Justice Major Arcana card, (Pictured to the right) has gorgeous caramel/ golden colored skin and black curly hair with highlights. I invited the person to take a closer look at the Witches Tarot Facebook page where they could see a large image of the Page of Pentacles, who is stunning and who is- by the way- a young woman of color. 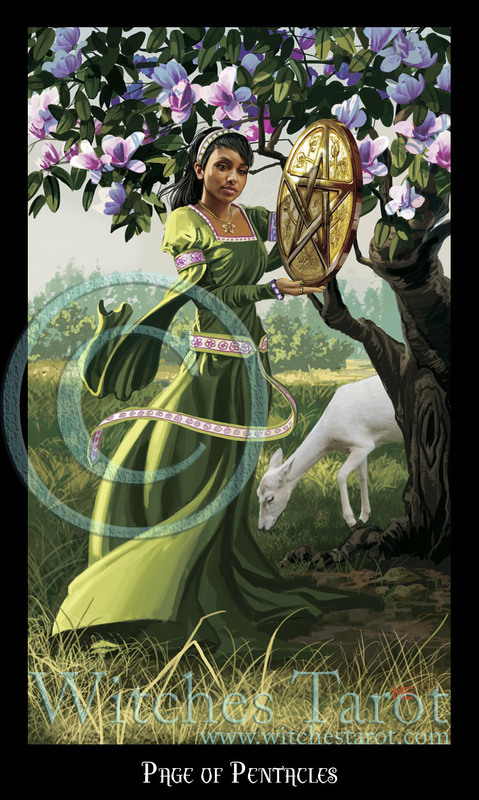 I also noted that the 3 of Pentacles, the Knight of Pentacles, and the Queen of Pentacles are all beautiful people of color. Actually the 3 of Pentacles is one of my favorite cards in the entire deck! There is a sorcerer's apprentice vibe to this particular card. Just wait until you see him! Honestly when I designed and scripted the Witches Tarot it only made sense to me to have some diversity in the deck art. The artist Mark, and I had several conversations about this topic. 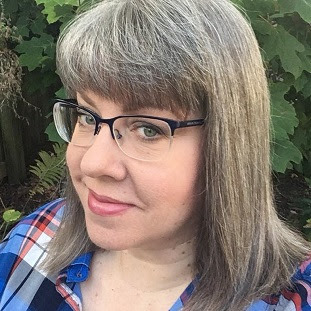 To my delight I noticed when I came back from touring there was a new post on the Llewellyn blog. Where the person noted that they had gone and looked at the website and the Facebook pages. That they were "super pleased", and then they added,"Thanks, I am glad I was wrong about that!" I am thrilled that they took the time to look again and are happy with what they see. Just today I found a lovely comment on the card image of the Page of Pentacles, from a Facebook follower thanking me, "for including brown-skinned Witches in the deck!" That their favorite decks "are the ones that represent people of all ethnicities in them." Which just made my day. Witches come in all beautiful shapes, sizes, and colors. I hope that with the Witches Tarot deck, everyone will find something to relate to and identify with. So they can make it their own. 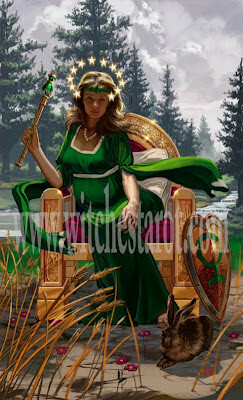 May the Mother Goddess smile down on us, reminding us that we are indeed all her children! The cards are really gorgeous. Great work ! Have a magical day and I hope Llewellyn will accept your book proposal. There is always going to be someone just itching to complain about everything. At least this person checked back and revised his/her stance. I finally broke down and ordered the deck. Can't wait to see them and get a feel for using them. The design on the back will make reversed cards stand out. This puts me off the deck. Well, it takes courage to admit you're wrong (especially in such an anonymous environment such as the internet) so it's nice that they took the time to reflect on their opinion. This is really a beautiful deck of cards. I love to buy this deck of Tarot cards. You have a nice psychic site here, I like the color and positive energy you put into it. Great work.